I once said that melodrama is a unique and powerful tool that is too frequently overused to be taken seriously. Terms of Endearment is a perfect example – it does not rely excessively on it, but uses actual characters and scenarios to take a caring audience on for its ride. Director/writer/producer James L. Brooks has truly done a fantastic job, writing an intricate, beautiful script (based on a book by Larry McMurty) and guiding immensely talented actors to give their best. The story concerns relationships – different kinds, different people, but all interlinked. While most movies will focus on one relationship, multiple are focused on here, over the stretch of a couple of decades. There’s Aurora (SHIRLEY MACLAINE), and her daughter Emma (DEBRA WINGER). There’s Debra and her husband Flap Horton (JEFF DANIELS), and there’s Aurora and the alcoholic womanizer astronaut next door, Garrett (JACK NICHOLSON). There are highs and lows, laughter and tears. There’s an obvious focus towards the first relationship between mother and daughter. It is the first we are exposed to at the start of the film and the last we are exposed to at the end. I was captivated by the absolutely wonderful way this idea is executed. Terms of Endearment is heavily emphatically based on character and emotion, and had anything been overdone for a long period of time – acting, writing, or even music, this movie would have begun to crash and burn. But it doesn’t. It remains mostly disarmed and completely fascinating for all 132 minutes. But notice I said “for a long period of time”. This is a movie that isn’t afraid to go for the easy pressure points of the audience – this can be a flaw, as much as a stylistic move. If you watch this, you might come across a few groan-inducing moments, but thankfully they don’t stick around long enough to become a serious calamity. I can see two schools of thought around Terms of Endearment – one is the idea I subscribe to, which approaches the film as a frankly observable unabashed melodrama, and a very good one at that. The other valid idea sees the movie as a sappy, syrupy waste. A bunch of good actors wasted with a script that will stop at nothing to make the audience drown in their own tears. I don’t know of many people that withhold both views – possibly because they’re polar opposites. 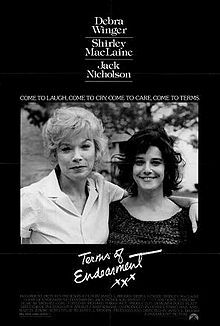 In the end, what I can endorse is that Terms of Endearment is a movie with superb acting, a commendable script, and strong direction. It is mostly irresistible, a worthwhile experience that everyone should look at once in their lives.